You have to check out the brand new Wink of Stella Brush. 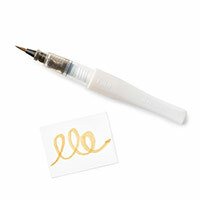 They are a glitter pen with a brush for accenting stamped images. They come in clear and gold. Today I have used the clear one! I have used the Balloon Framelits and die cut one in some acetate to create a stencil/mask. I placed it over the white card and sponged the Calypso Coral balloon first, then moved it down and sponged the So Saffron balloon. The next ones were Mint Macaron, Marina Mist & Wisteria Wonder. Next I used the Greetings Thinlits and die cut the “cheers” sentiment across the balloons. I then die cut another 2 of the same sentiment from scrap white card. I glued the card base and the stamped balloon sheet together and then glued the 3 layers of the cheers sentiment on top of each other, making sure I placed the coloured one on top! This gives that inlay look. Last of all, I added the Wink of Stella to the top of each balloon to highlight them. Click here to watch the YouTube video on the Wink of Stella brush. It has some really cool tips!